Life atop the Metro League can be quite precarious as Beaverton is discovering. Flying below the radar to begin the season, the No. 5 Beavers won 13 of their first 14 games, blowing teams out of the water and pronouncing themselves as Class 6A state title candidates. But with the success comes acute attention, particularly from other Metro teams in the second half of conference play. Sunset gave Beaverton quite possibly its best effort of the season, starting out strong and staying right with the Beavers until well into the fourth quarter on Friday night. Nursing a 45-40 lead with just under a minute to go in the fourth, Beaverton went to the free throw line to put the game away for a 49-41 win at Sunset High School. The past two games Beaverton's been tested, first by Liberty on Tuesday and now by Sunset. They're getting the title contender treatment, if you will. Foes now get up and bring the energy to Beaverton, realizing the Beavers' bent, just as Sunset did, fighting through the final fourth quarter whistle. 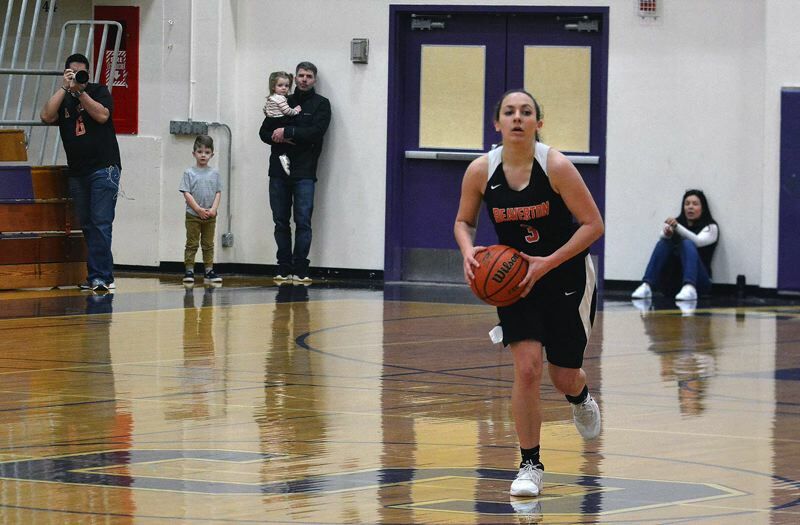 "I think we took a step back from where we have been," Beaverton senior forward Cierra Speck said. "But, I can tell you that's not going to happen again and we're gonna turn a corner. Now it starts to get interesting because we're in the second half (of Metro). Everyone is out to beat us, playoffs are coming up. It's a long season, but we know we have to amp it up. That's what keeps us going." There's been a paradigm shift from cellar dweller the past two seasons to stacked with Speck, Laura and Sydney Erikstrup, Mary Kay Naro, Alexa Borter and company this year. In the span of two months, Beaverton has morphed into the hunted instead of the hunter. "Everyone knows we're here, we're ready to go," Speck said. "The teams we're playing for the second time are so enthusiastic about beating us. Last year it was so different and now the tables have turned. As young as we are it's hard not to get flustered when we're 'off', but I think we do a good job of keeping each other up when things don't go well." Afterwards, the two teams came out of their locker rooms with distinctly different tenors. Sunset was euphoric. Apollo senior guards Kendsy Carmichael and Delaney Ragan were tremendous, setting an aggressive, fearless tone from jump street with gallant drives to the rim, strong rebounds and bold defense. With a big crowd on hand and a ballyhooed opponent across from them, Sunset sustained a high level of play and better yet, intensity for four quarters. "We were really hyped for this game, it was awesome," Carmichael said. "We wanted to go out and play our best and I think our energy started out on fire and we kept going throughout the game. We never let up. It was a great showing for us." For a young team still finding its way, the Apollos looked better by leaps and bounds compared to where it was six weeks ago. Junior guard Vanessa Lopez followed her senior backcourt's lead, driving the ball headlong to the rim, getting to the free throw line, making shots inside the lane. Grace Kimball boosted the Apollo front line with heady defense and sage finishes around the lane. Ragan scored two layups in the fourth quarter, the latter of which brought Sunset with 45-37 in the fourth. And Lopez, after getting fouled on a three-pointer, marched to the charity stripe and swished all three attempts to shave Beaverton's lead to 45-40 with 53 seconds left in the contest. "We played team basketball the whole game," Carmichael said. "I don't think any of us were selfish at any point. We went all out. Every time we made a mistake we kept encouraging each other and kept the momentum up no matter the score." Sunset, hoping to limit Laura Erikstrup's looks in the post, deployed a matchup zone defense that essentially built a roadblock around the Beaver sophomore post as she tried to free herself floating amongst the Apollo defenders. The Beavers plays a selfless brand of offensive basketball that seeks out the best shot, not a good look but a great one. 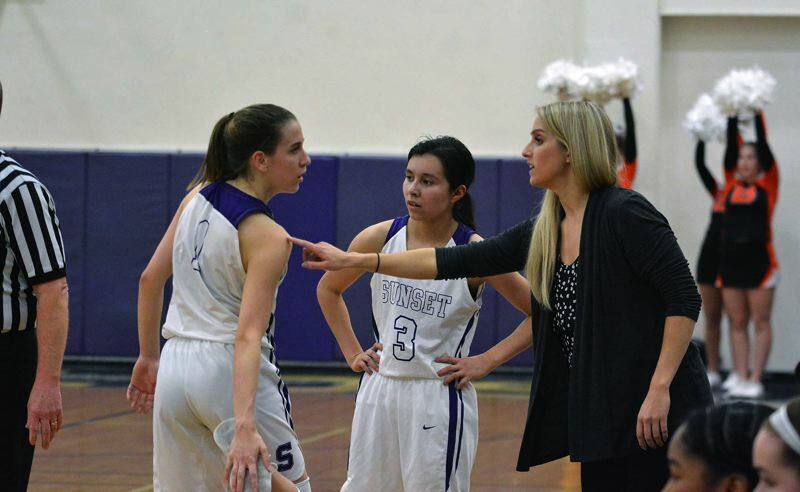 And when those opportunities arise, the Beavers have ample shotmakers, snipers like Mary Kay Naro, Mackenzie Naro, Barton and the Erikstrup twins who stretched out Sunset's zone defense with six first-half threes, five of which came from Barton and Mackenzie Naro. Rather than sit back and survey, Beaverton set its zone attack in rapid motion, passing, cutting, making quick decisions. "It's really easy for us to play unselfishly," Speck said. "We all know the game really well to do that." But Sunset was sound and stayed within single digits thanks in large part to filling the wings and running the floor hard off long Beaverton misses. Ragan and Carmichael led the charge, pushing the basketball whenever they corralled the rebound, not letting Beaverton set up is halfcourt defense. And Laura Erikstrup couldn't get the rock in her in favorite spots on the floor for much of the game, which allowed Sunset to remain tethered to their conference rival. "Not being able to get the ball to our posts made us crumble a little bit," Speck said. "We're good at getting the ball to Laura and Laura is really good in the post. That made us shaky a little bit. (Sunset's) defense caught us off guard and their gameplan worked. We took outside shots and they got the ball back. I think we took good shots, they just weren't falling." 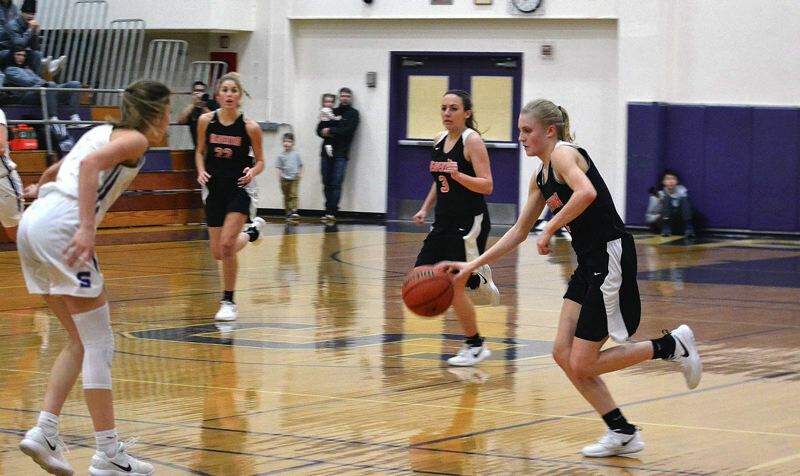 Beaverton went on a 12-2 third-quarter run thanks to its customarily suffering man-to-man defense that generated four fast break buckets from both Erikstrups that gave the Beavers a 40-24 lead. It felt like the Beavers were about to bury the contest and cruise to another blowout. But then Ragan came down rebound, raced rim-to-rim to bring Sunset within 41-28 and Lopez carved inside for another two to make it 41-30. At the end of three Sunset trailed just 41-30. "We looked at the clock said 'We have to put it all out right now'," Carmichael said. "It was our final push. What we've been working through the whole season showed right there, just to keep the momentum going no matter what was happening with the score. In the past, we've kind of lost teams in the third quarter and tried to come back but just dug too deep of a hole. Tonight we wanted to come out (in the third) with the same energy we started with." The Erikstrups controlled the final minute of the fourth, pickpocketing a steal each while both making a pair of free throws. Following a rocky beginning and a feeling out period of sorts to start the year, it's safe to say Sunset is on the upswing. And if Beaverton is a barometer for how much Sunset has improved, rest assured the Apollos will be a factor in the second round of Metro action. "It's very encouraging and exciting to see this," Carmichael said with a smile. "We were such a new group at the beginning. We've gotten better every game and it's noticeable when we watch film and in practice. I think it's going to be great rest of the season. On the court and off the court we've bonded and become really close. We have really good team chemistry in the sense that we know where we people are and when they're going to be there on the court. When a player gets down, the rest of the team encourages them. That's the biggest thing that starts the energy and the buckets. Everything kind of stems from that." Sunset is 6-11 overall and 2-8 in Metro. Beaverton is 15-2 overall, 9-1 in Metro and No. 7 in the 6A power rankings. Beaverton plays at Glencoe on Wednesday and hosts Jesuit next Friday at 7:15 p.m. Sunset hosts Southridge on Wednesday and goes to Westview on Friday.